THE YOUNG MAN standing next to me in this photo is Chris Spurgeon. He's been a loyal Second String Music guy for a long time, and we've appreciated his business. Chris has a few guitars. 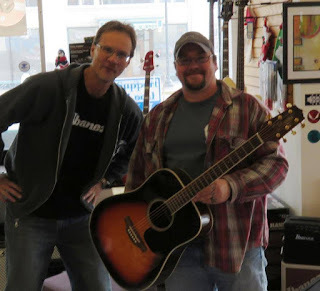 A while back he bought a beautiful Takamine acoustic - Sheryl made him a deal and he couldn't refuse. He loves the guitar. In October he came to the store to browse and he said, "I have this guitar I don't play very much. I'd like to donate it to Six String Heroes." Last week he came back with guitar in tow, and the donation was made. The program is going very well in Quincy - I have three Six String Heroes students in lessons right now, and the whole therapy through music thing has never been more evident. One is a beginner who wants to play a song for his wife next summer for an anniversary present. Another has a bunch of guitars but never really learned to play. And the third veteran already plays but needs navigational help, and the guitar is his life-saver, in many ways. Chris might not think it's a big deal, donating his guitar, but it is. Donations like this are the lifeblood of Six String Heroes, which helps veterans but receives no funding from the government. Chris didn't ask for recognition, but I'm giving him some love because this guitar will find a good home and make a huge difference for a veterans. Chris didn't say much and he was pretty low-key about the whole thing, but you could tell he got more joy and satisfaction out of donating the guitar than he did when he bought it, and that's a big deal for a guitar player. At Christmas, it's all about the giving. Thank you, Chris. Your donation won't be forgotten.